Book of Mormon Central / Archive / Study of "Lehi in the Wilderness Discovers the Liahona"
Title Study of "Lehi in the Wilderness Discovers the Liahona"
22 3⁄4 x 31 1⁄2 in. Perhaps the most memorable work of Friberg’s Book of Mormon paintings, Lehi in the Wilderness Discovers the Liahona, is familiar to nearly all members of The Church of Jesus Christ of Latter-day Saints. For some, its familiarity may undercut the inventiveness and originality of Friberg’s work, which—as was true for all his Book of Mormon paintings— was the result of many studies detailing every aspect of the painting. You have to decide if [the Liahona] is going to be this big. Now I don’t know any more than [the next guy]. But, I have to paint something. Although, the Liahona takes up a small amount of space within the image, it is the focus of the entire composition. 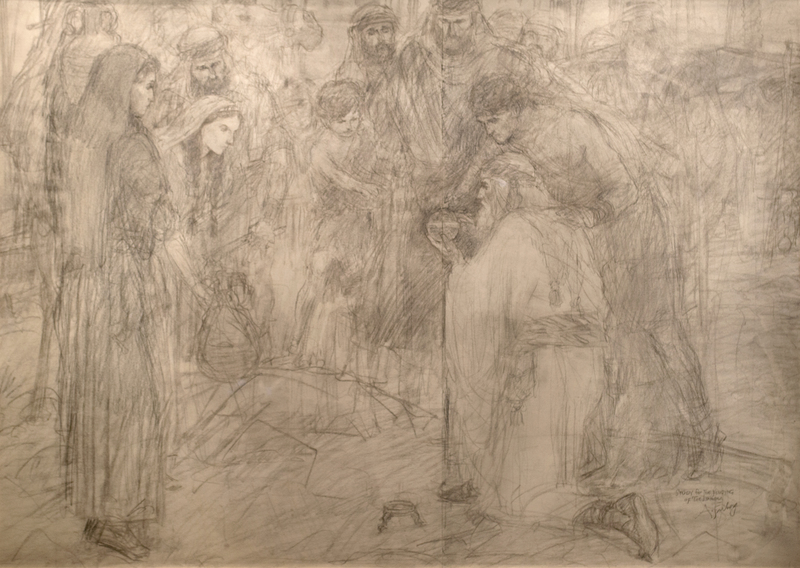 To accomplish this sense of focus, Friberg both directs the actual gazes of all the figures in the work towards the Liahona, and, employing his classical training, uses the Golden Mean, a mathematical equation found in nature and used by artists since antiquity, to naturally draw the viewer’s gaze. In addition to his well thought out compositional plan, Friberg did separate portrait studies of each individual. Friberg used models encountered in his various social circles, including friends, family, his home teachers, and actors working on the set of The Ten Commandments (1956), where he was employed by director Cecile B. DeMille to help with the conceptualization of sets and costumes. After arriving at his desired result in a separate portrait, each character in Friberg’s paintings remains consistent throughout Friberg’s subsequent oeuvre.